Putting a plaque in its proper place, after earlier inaccuracy. 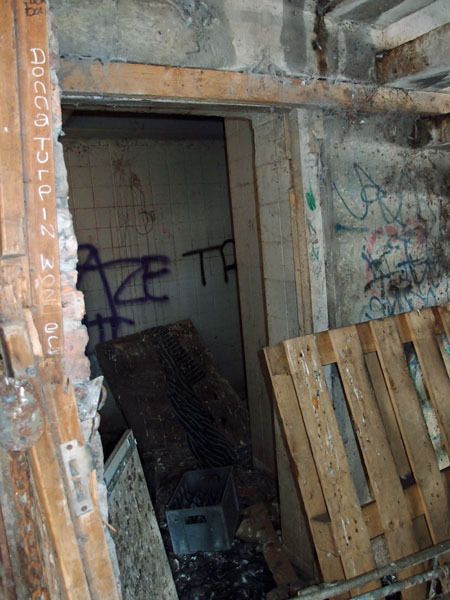 As previously mentioned, a highlight of the plaques walk was the investigation of an old abandoned public toilet. No, really, it was. Which makes the walk sound a bit rubbish. That’s not what I mean at all. It was so interesting I’m revisiting it. Our small plaque-bearing party headed off from Spurriergate towards what in recent times has been known as one of the snickelways, but which we used to call an alley or a lane. Church Lane curves round towards Low Ousegate, and at its bend is a grubby old alley leading straight down to the river. 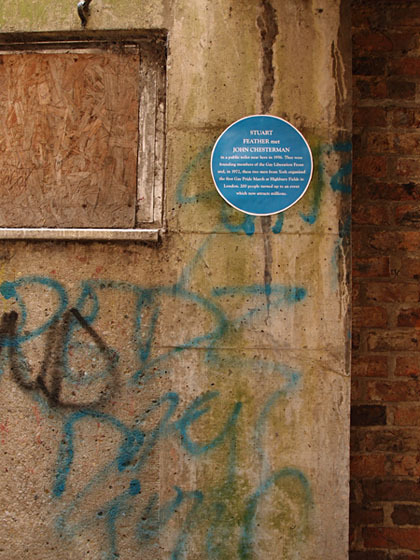 Paul was about to place on a wall near this corner a plaque referring to some toilets which used to be near here. 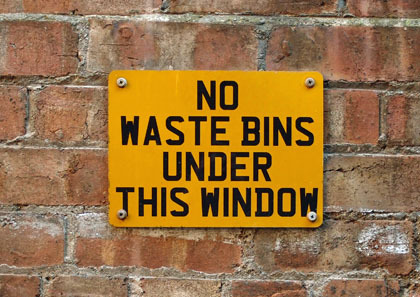 ‘The toilets were down there!’ I declared, confidently, pointing down the grubby alleyway. 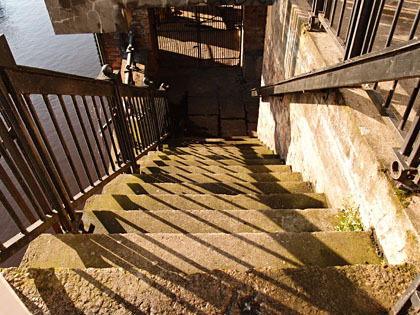 ‘Down at the bottom, near the river!’ And we all set off down the grubby alleyway. Well, dear readers, I was wrong. Or rather, I was partly right and partly wrong. In the interests of factual accuracy, because we care about that on this site, and challenge myths, clarification is needed, so let’s recreate last Saturday’s wander. As I did a few days later when revisiting to take some of these photos. 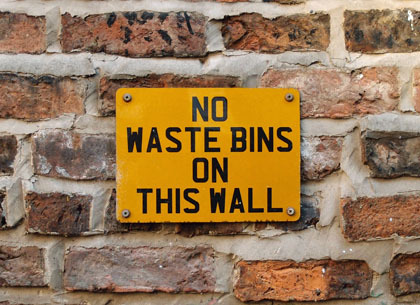 The alley is full of bins and signs about where bins shouldn’t go. Clearly there’s an issue with badly placed bins. 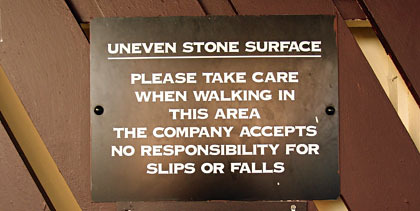 This sign is a few metres along from the first one. It used to be called Fish Landing Lane. No fish around here now, but clearly there’s some wildlife, as indicated by a container full of rat poison, placed prominently on a wall. 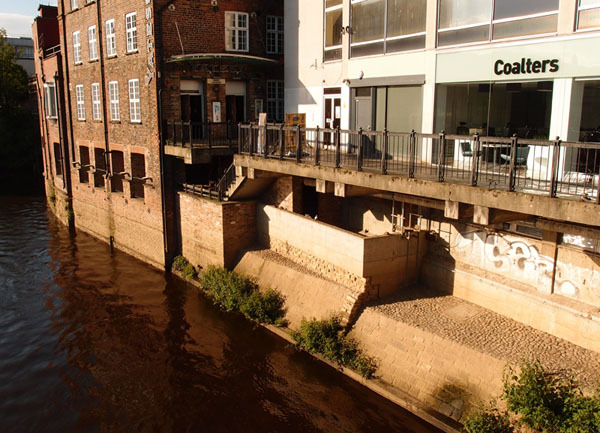 At the bottom there are steps, concrete steps, up to a concrete riverside walkway, just a short stretch, past two shop units, then you’re at Ouse Bridge. The walkway also leads to an entrance to Yates’s. Under the concrete steps there used to be public toilets. They’re still there, but haven’t been used for years, except by pigeons. We discussed their previous life — Richard remembered them too. Paul placed the plaque on the wall and and we took photos. We all headed back up the alley, away from the pigeon poo and graffiti, back to Coney Street, glad to have seen a bit of authentic ‘old York’. … but I was wrong. 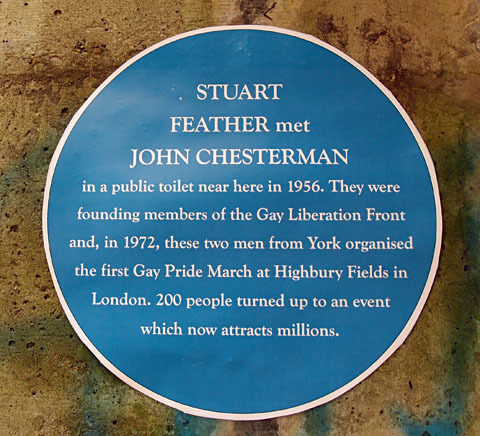 Later on, back at home, I thought about the fact that the plaque marked a meeting in the 1950s, and that my memory of those toilets at the bottom of the lane was decades later, the 1980s. Where we girls used to check our make up and if necessary reapply our eyeliner before heading into town. Would those toilets have been there in the 1950s? Were they old enough? It bothered me. I emailed Stephen, as I knew he lived in York in the 50s, and I thought he might be able to help. As indeed he did. Thank you Stephen. 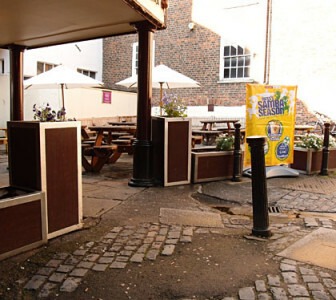 He said he remembered toilet facilities nearer the bend of Church Lane, in or near what is now Yates’s beer garden. 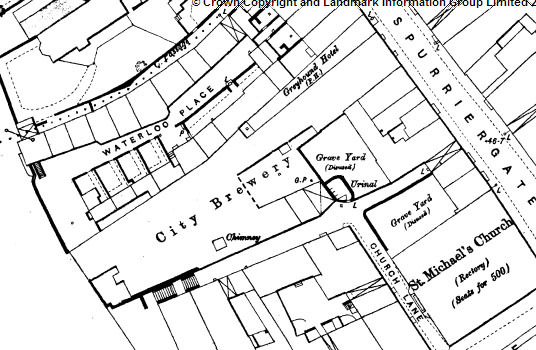 After much searching, I found ‘urinal’ marked on the 1891 town plan. At this corner where the narrow alleys met setts were set in various patterns and directions with cart tracks between, in the 19th century and perhaps reordered since. I remembered too a book by Hugh Murray on the history of public toilets in York. It has the fab title Where to Go in York. I don’t have it, but found the library did. Clifton Library had a copy, even more convenient. But it was Sunday, and Clifton Library wasn’t open. I spent Sunday in eager anticipation of finding out the answer to all my public-toilet-related queries, and on Monday afternoon jumped on my bike and cycled really fast up to the library — and even faster back again, as it was about to rain heavily — and got back with Hugh Murray’s book tucked in my rucksack. And what an interesting read it is. 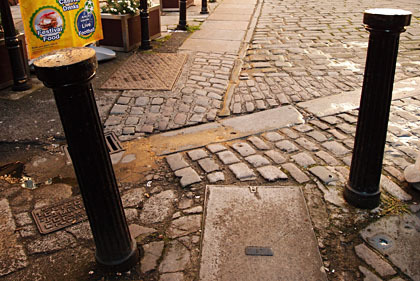 Church Lane’s first urinal was provided in 1857. Urinals in those days tended to be roofless. The goings-on therein were apparently clearly visible from the upper floors of nearby buildings. Hugh Murray’s book records complaints being made by the occupants of these properties in 1872. The solution was to put a roof on the urinals, at a cost of £20. The proximity of the urinal to the back of shops in Spurriergate resulted in later complaints too, in 1957, by the owners of a handbag shop overlooking it. It wasn’t just a toilet facility, but a meeting place. See Paul Furness’s article in York Mix (Location 4) for more information. Loos near the Ouse, 15 August 2004. Can be enlarged. 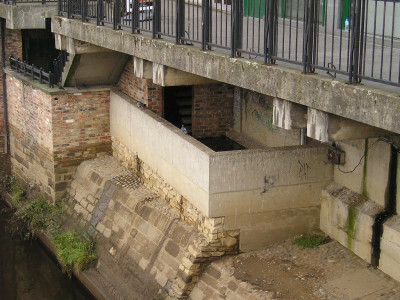 In 1966 new toilets for men and women opened in a purpose-built facility at the bottom of the alley, near the river. And those, of course, are the ones I remember. And where we placed the plaque. Which, as we now know, should be on the corner near Yates’s. They were still in use in around 1983, closed at some point since. (Perhaps closed in 1987 or thereabouts. Hugh Murray’s book says the facility was rented on a 21 year lease.) This photo was taken in August 2004, from Ouse Bridge, on one of my ‘York Walks’ of that year. Above the toilets, accessed from this concrete walkway, was a record shop I remember visiting a lot. 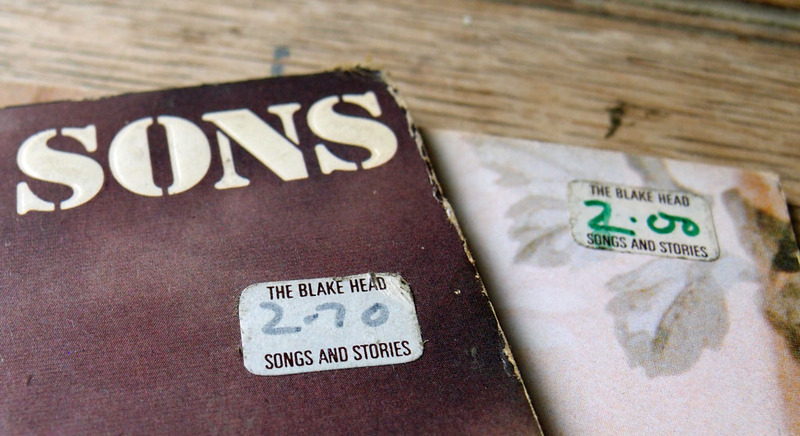 I may have misremembered, but as I recall it was called ‘Songs and Stories’. But that’s a story for another time. After a bit more about toilets. 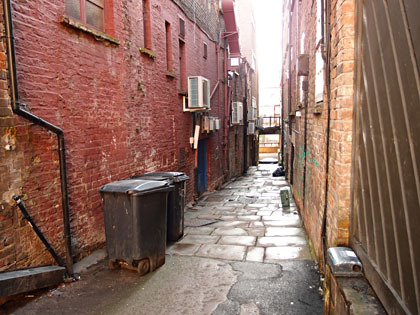 Actually there are many stories spinning off from this grubby alley, and I’d like to share them, but I’m no longer able to give everything away for free so I’ll be trying to sell them to you later instead. More on that story later too. For now, let’s escape this pigeon-poo-plastered place, and head off elsewhere. To another toilet. Mind how you go though, as we pass yet another warning sign, near the back of Yates’s. i do remember the book shop , not sure of the name tho, i called it the book and record exchange, think it mainly dealt in second hand stuff ? Bought one of those in ’83, the other 1984 I think.